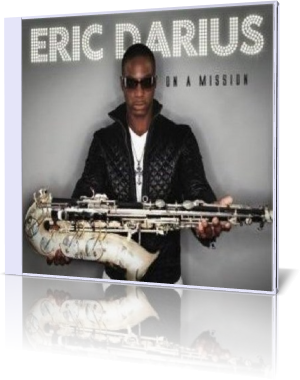 Although Eric Darius counts artists like John Coltrane, Cannonball Adderly, and Charlie Parker to his idols, he is mainly influenced by Grover Washington, Jr. and Kirk Whalum. Summarized said, he is "Mr. Smooth Breeze". Eric's debut album Cruisin was released in 2000. Better known are his follow-ups Night On The Town (2004), Just Getting Started (2006), Going All Out (2008) and On A Mission (2010). Settin' It Off is Eric's invitation to his glittering party. His multi-layered sax engagement kicks you right on the dance floor. Soulful Stride shows more of Darius' sensual sax blow, which keeps you hooked with urgency. Ron Reinhardt's Rhodes solo lets you only a short time for some recreation. But then Let's Go! just splashes over you. You cannot escape this party movement. The whoop up continues with Uptown Swagger featuring James Loyd tinkling on keyboards in his well-known style. Star producer Rex Rideout has the hand on Jean Marie's Groove, but Eric's sax keeps the lead with exuberant overdubs. Top notch shopping, pulsating night life and entertainment are some of many delights Jamaica's capital has to offer. Kingston's Flavor is captured by Darius in this Reggae tune. Butterfly was the opening track on Herbie Hancock's 1974's landmark CD Thrust. Eric shows his skills on the path of Bennie Maupin well supported by Rick Braun on muted trumpet. Also remarkable Chris Andrews on piano. From jazz to techno. With Move To It Eric Darius dares the great jump in style. Nu Trane Of Thought brings back an Urban groove. My Prayer For Haiti is Eric's spiritual and emotional contribution for this island beaten by the fate. Blazing young Eric Darius' new album On A Mission is a musical patch-work of styles. Venturous, naturally gifted, amazing and convincing.